Self-advocate Jan B. presents about self-determination. When the disability movement first began working to improve the lives of people with intellectual and developmental disabilities (I/DD) back in the 1950s, it was a movement led almost exclusively by parents, friends and allies -- people without disabilities. Over time, as people with I/DD become more involved in representing their own needs, the self-advocacy movement emerged. Fundamentally, self-advocacy is about people with disabilities speaking up for themselves. Although self-advocates may seek support from others, they are entitled to be in control of their own lives. 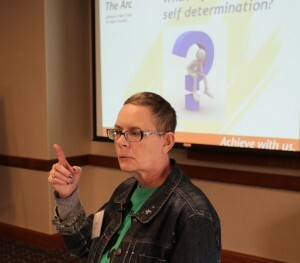 The Arc supports the development of self-advocacy skills and experience through a variety of programs designed to elevate the voices of self-advocates. Use the buttons below to learn more about our programs. To demonstrate our commitment to including the voices of self-advocates, we created an advisory council of local self-advocates. 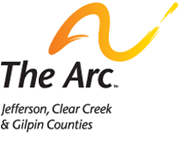 The purpose of this Council is to provide guidance and advice to The Arc's Community Outreach team in developing activities and events that are truly inclusive, relevant, and beneficial to self-advocates and to our community as a whole. These activities and events will be aligned with strategies related to self-advocacy in The Arc’s Strategic Plan. This council has weighed in on topics such as DD Awareness Month and LifeAbility Talks. If you would like more information about this council, please contact David Eaton or Valerie Smith at (303) 232-1338. The National Council of Self-Advocates (NCSA) is a leading organization for self-advocates involved with The Arc of the United States and its chapters across the nation. NCSA influences The Arc’s advocacy efforts, informs The Arc’s programming and ensure people with intellectual and developmental disabilities have the same civil and human rights that every citizen enjoys. Click here to learn more at www.thearc.org.